Does footage of Chamberlain’s 100-point game actually exist? Apparently, footage of Wilt Chamberlain's legendary 100-point game may well exist, according to Memphis basketball coach Josh Pastner. 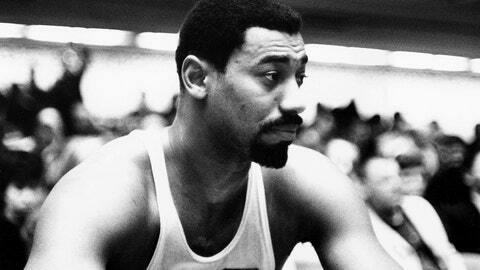 On March 2, 1962, Wilt Chamberlain scored 100 points in an NBA game. That much we know to be true. But if you weren’t one of the 4,124 fans at Hershey Sports Arena to see the Philadelphia Warriors’ 169-147 win over the New York Knicks live that night, then you’ve never seen it for yourself — and until recently, there was no hope that you would ever do more than hear it ever again. Fortunately, Josh Pastner’s father was there, as a ballboy for the Warriors, and the Memphis basketball coach’s dad says he has videotape from Wilt’s record game. Problem is, he has no idea where the reel is. The revelation came to light Saturday, when Pastner’s Tigers were in Philadelphia to face Temple. Pastner was reflecting on his family’s ties to the City of Brotherly Love after Memphis’ 79-69 win when he shocked reporters by revealing his dad’s priceless possession. “My father and his father taped the game reel-to-reel in the second quarter when it was in Hershey, Pa., in the 100-point game,” Pastner told reporters, via The700Level.com. “They started when he had like 30-something; they thought it was going to be a special night. So one of the most sought-after pieces of videotape in sports history might be sitting in a musty box in someone’s attic. Or maybe it’s in the shed. Or maybe it got thrown away. Or maybe it got sold at a garage sale. Actually, when you get a chance, go check your attic, you know, just in case. And if you find something, please do let us know. • The tale of Wilt’s 100-point game tape might not even be the strangest one Pastner told. In the same story, read about how Chamberlain had Pastner’s dad check his soda for poison, as well as the time his grandfather died in his seat at an Eagles game. Seriously. • Nick Saban explained his hiring of Lane Kiffin as Alabama offensive coordinator. • Christian Laettner’s jersey from “The Shot” game sold for six figures at auction. • Kobe Bryant gets expensive haircuts. • Mike Tomlin uses the word “obviously” a whole lot, obviously. Who still has facebook anyways? Lol. I'm going to release a statement on my MySpace Music Page. @NickDeBabylon no I think I have 12. Just enjoying life. I didn't know that was a problem. • Derek Holland’s dog is to blame for an injury that will keep the Texas lefty out for several months. • At least one Louisville recruit will reportedly not have his commitment honored by the new Cardinals coaching staff.